This entry was posted in Christian Life, Family Life, Uncategorized and tagged Barnes and Noble, Christ in Christmas, Christians, Christmas, Hanukkah, Happy Holidays, Holidays, Jesus Christ, Kwanzaa, Merry Christmas by Barbara Lane. Bookmark the permalink. I usually say “Merry Christmas,” and inadvertently say “Happy Holidays” sometime. I worked where one employee tried to lodge a complaint against our secretary who sent out a “Merry Christmas” greeting saying she was trying to push her religion on us. I said “Merry Christmas” more than ever that year. I caught myself saying “Happy Holidays” sometimes. I tried to never say that again. It is “Christ”mas to me. Christianity tried to replace the heathen holidays. The one that has been the hardest to get rid of is halloween. I am glad most of the heathen holidays were replaced, and I wish that halloween was replaced too. 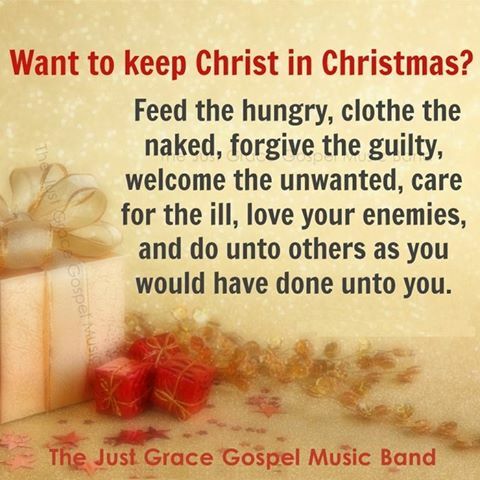 I appreciated this fact much more when I saw there were those who would like to take away our freedom to rejoice over Christ in Christmas and easter mostly. I am glad for every “Merry Christmas.” I am very sick, so can easily not want to rejoice, but I do because my total hope is in Christ. God bless, and Merry Christmas. I certainly was not trying to say not to say Merry Christmas. That is what I always say – and I hope all Christians will always say. Just wanted to say that we need to not be so unkind to those who are not believers. We cannot expect unbelievers to behave as we Christians do. So – regardless of what greeting they give us – we need to respond in love. When someone says “Happy Holidays” to me, I always reply “Thank you and Merry Christmas to you.” Keep saying “Merry Christmas” – just please don’t be unkind to someone who wishes you “Happy Holidays.” So glad your hope is in Christ. Merry Christmas to you!